Speaking on ITV’s Good Morning Britain shortly after the UK public voted to leave the European Union, Farage said he didn’t know which Conservative politician he would like to step up, either. It is widely thought that Prime Minister David Cameron, who was a supporter of the Remain campaign, will resign if Brexit was the winning vote in the polls. The UKIP leader said he is keen for the Conservative Party to draw up a negotiating team, including Tory politicians Peter Davies, John Redwood, and Peter Lilley. “All I’ve ever tried to do is tell the truth as I see it … to get us back to being a self-covering nation. 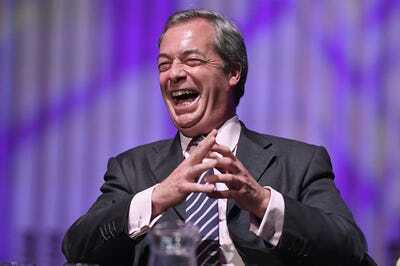 I have been demonized every single week because I’ve dared to talk about immigration,” Farage said. Farage was then challenged by Good Morning Britain Susanna Reid about Vote Leave’s bus campaign which suggested Britain spends £350 million a week to Brussels that could be better-spent on the NHS. The figure was widely-contested because it doesn’t include the rebate Britain also receives. Reid asked whether Farage could now guarantee that £350 million would be returned to the National Health Service. “I would never have made that claim, it’s one of the mistakes the Leave campaign made and would be a guarantee I can never make,” Farage said. Reid and co-presenter Piers Morgan than challenged again that some people may have voted for Leave on the back of a misleading ad. Donald Trump comes to the UK today to visit Scotland. Morgan said some people have made comparisons between Farage and Trump. He added that “there is something that is happening in American politics that is perhaps a mirror of what’s happening here” — a feeling that Washington is too remote from the rest of the country. “I don’t agree with everything he says, but he must have a chance of winning,” Farage said.